For more details and a full program listing, go to the programs page and download a Fall 2015 schedule. Art history lecture series, topics include: Images of the Virgin Mary, The Last Judgement: Michelangelo and the High Renaissance, and a guided tour of the Saint Louis Art Museum for the last class session. $4/week or $8/3 weeks, to register call 314-779-9231 or complete registration form and return it to the Shepherd’s Center office, see link below. 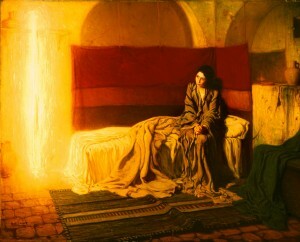 Henry Tanner, The Annunciation, 1898, one of the featured paintings in the class, pictured at right.